Exclusive Excerpt and Giveaway! 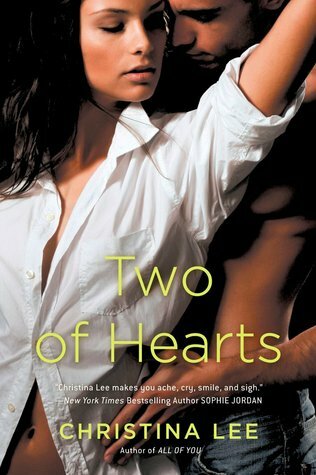 Two of Hearts by Christina Lee! Today, right here, right now you have the chance to read an exclusive excerpt from Two of Hearts by Christina Lee. I just finished it last night, and it is DIVINE! The release date is May 5th so you don’t have too much longer to wait til you can read it yourself!!! When her eyes narrowed, I knew I had struck the nail on the head. But she wasn’t about to admit to any weaknesses. In some ways, Dakota was just as hardheaded as she’d always been. Hot and cold, just like I’d remembered. “Are you shitting me right now?” I worked to keep my lips in a neat, straight line. That was a low blow, and she knew it. She was just trying to get under my skin. Push me away. I slid my fingers around her waist, my other hand at her neck. Her hair was up in a loose bun but I wanted so badly to feel the silk glide through my fingers. See it fanned across my pillow in the morning. “Could . . . have . . . picked up your phone,” she said, between broken breaths. “You could’ve, too,” I said, my mouth sliding along her throat. “You wanted to go,” she whispered. You can enter to win any one e-book of Christina Lee’s just by leaving a comment. If you choose Two of Hearts you will receive it after it releases. Giveaway will run through Sunday , May 3rd. Thanks and hugs to Christina for allowing me to host the excerpt, and for the giveaway! This entry was posted in Adult Romance, Book Crushes, Book Recommendation, Books, Christina Lee, Excerpt, Exclusive, Favorite Authors, Giveaways, Romance, Upcoming Release and tagged Adult Romance, Book Crushes, Book Recommendation, Books, Christina Lee, Excerpt, Exclusive, favorite authors, Giveaways, Romance, Upcoming Release. Awesome!! I love Christina Lee!!! You don’t see many stories (at least contemporary ones) where a Native American is the main character. I am anxious to explore that AND to see why Shane ‘suddenly’ left town. So far I’ve read There You Stand and I’m currently reading Two of Hearts. I am in love with everything I’ve read so far and I’d love to read the previous books in the Between Breaths series. Christina is an amazing writer! Can’t wait to read Two of Hearts!!! Y’all always have great give a ways! Excited to get this to read. Thanks for sharing the excerpt with us! Love Christina Lee! Great excerpt, can’t wait to check it out! I believe I’ll be pushing this to the top of my “to be read” list. I love Christina Lee’s stories. The Between Breaths series is great. I look forward to reading more from her! I love Christina Lee’s work. Two of Hearts sounds wonderful. I loved the excerpt.